Two friends. One life-changing vacation. Hollie can’t catch a break. She’s broke, she’s back living with her family, and her career prospects are precisely zero. So when the chance arises for her and her best friend to escape to New York, well, she can hardly say no, can she? Little does she realise the charming stunt performer she just met is about to introduce her to Hollywood royalty. But are the Hollywood elite really who they claim to be, or is there more to their stories than they let on? 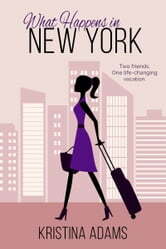 Find out what happens next in the sassy, seductive debut perfect for fans of Paige Toon, Sophie Kinsella, and Marian Keyes.